Born in April 1884 to Irish immigrant parents, Michael J. Cullen learned about the grocery business during his early years of employment. In 1902, at the age of 18, he worked as a clerk for the Atlantic & Pacific Tea Co., where he worked his way up to division superintendent. After 17 years, Cullen moved to the Midwest, working for Mutual Grocery Company (Illinois) and Bracey-Swift (Missouri). He next moved to the position of General Sales Manager at Kroger Grocery & Baking Co. (Illinois). Cullen’s natural marketing talents, work experience observations and insight in the grocery business led to his idea for mass merchandising – selling high volume at low-profit margins. While employed as the manager of 94 small Kroger Grocery & Baking Company stores in Illinois, Cullen wrote a letter to a Kroger Vice President, describing his ideas that would eventually revolutionize the industry. Cullen’s letter went unanswered. His letter detailed his vision of “monstrous stores, size of same to be about forty feet wide and hundred and thirty to a hundred and sixty feet deep, and the ought to be located one to three blocks off the high rent district with plenty of parking space, and same to be operated as a semi-self-service store – twenty percent service and eighty percent self-service.” Undaunted, and confident in his ability to see his idea become a reality, Cullen resigned and moved his family to Long Island. Success of the supermarket was instantaneous. People came from miles around. To the public, King Kullen was more than a convenience – King Kullen supermarkets meant affordable food and gained recognition as the “World’s Greatest Price Wrecker.” The Food Marketing Institute has stated that King Kullen “served as the catalyst for a new age in food retailing.” King Kullen opened its second store a few miles from the first, on Jamaica Avenue in Bellaire, Queens. Here, the company established its first headquarters, in the building’s former garage. Within two years of opening, there were eight King Kullen stores, each of which larger than the first location. By 1936 there were 17 King Kullen supermarkets, withannual sales of approximately $6,000,000 annually. Although Cullen died suddenly, just 6 years after opening his first store, King Kullen continued to grow and expand through the leadership of his wife and the support of family members. During the 1950s, the company expanded eastward on LongIsland, where it remains firmly entrenched as Long Island’s own supermarket. A positive relationship between management and employees has been one of the greatest contributors to the success of King Kullen. A leader in employee relations, King Kullen surprised the industry by providing its employees with insurance, vacation and pay raises in the late 1930’s, and by 1940 was firmly established as New York’s premier supermarket. In the annals of merchandising history, Michael J. Cullen’s story stands out as one of vision, courage and tenacious perseverance. Like the best of the innovators from our nation’s past, the contributions he made to society during his lifetime continue to affect us to this day. 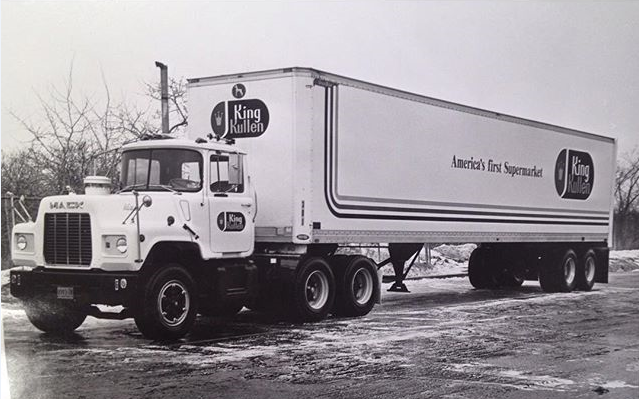 Today, three generations later, King Kullen is still family controlled and operated, remains a leader in the supermarket industry and is recognized by the Smithsonian Institute as America’s First Supermarket. We’ve added a lot since that first store opened: pharmacies with online refills, a fresh flower shop for fresh cut flowers, a large deli, catering and prepared foods department, a local bakery for fresh baked goods every day, and healthy and organic offerings in every store, and we are piloting online grocery shopping (with delivery) in four of our stores. From that very first store, we now have 32 locations in Nassau & Suffolk Counties, and we’re still going strong.